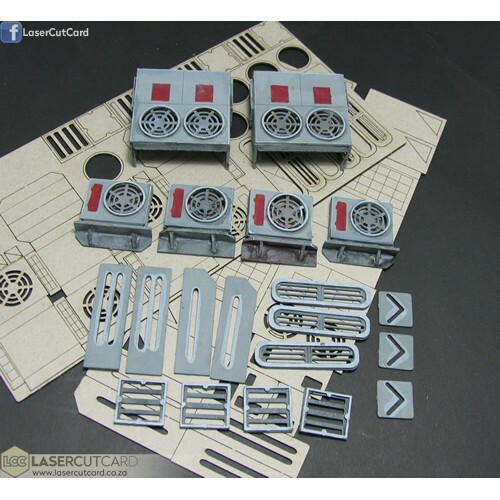 Discussion in 'Scenery' started by Camden Leisure Pirate, Nov 8, 2018.
https://www.customeeple.com/product-category/sci-fi/infinity/scenery/ has some scatter terrain, airbrush stencils and ladders, but not detailing bits, as such. Beyond that, you're best off asking in the Infinity Terrain Facebook group, as posters aren't allowed to link to non-partner terrain on the CB forums. jherazob and Camden Leisure Pirate like this. I'd like to mention that you should look up the Maelstrom's Edge terrain sprue, which as ijw mentions i can't link to but can mention, should be the first hit in a search. They make a sprue of details specifically to make terrain out of boxes and the like. Since that game is also sci-fi, it works just perfect for us. CB should get one of their partners to do something similar. I do believe these guys are UK based. Ben Kenobi and Camden Leisure Pirate like this. Thanks fellas, that's plenty to be going on with. There is a company called Laser Cut Card, they're based out of South Africa (so website has .co.za at the end) but because they're shipping relatively small pieces of paper around shipping is dirt cheap and fast (it's sent at the letter costs!). They make sets of doors, windows, and air conditioner units. The air conditioner units can be a bit fiddly to assemble, but overall I really recommend their products. timberfox, xagroth, Oyentido and 4 others like this. I had forgotten about them! Do have in mind that they have the terribly annoying habit of completely closing the shop when they're on vacation, i mean, it's an internet shop, what's this, the 80s? Camden Leisure Pirate likes this. Lasercutcard are also remaking the full range after supplier issues (now different carboard thickness, meaning parts would not adjust if not changed). So many models are unavaliable (luckly doors and similar are up). Mantic has a crate or two of doors and complements, BTW. No idea of quality. The mantic stuff is hard plastic (poly cement glues it - well, the good ones, do. Some of the n-butyl acetate solvent ones have some trouble, but plastic-weld works a treat. Superglues also work (sorta. Surface bonding only UNLESS you sand both surfaces first to maximise surface area). Miniature Scenery.com also has a detailing set with cool widgets and doors. I believe they even come with little cameras too. We bought about 8 sets of them to detail the mini duels kickstarter terrain and the doors are really cool. Camden Leisure Pirate and chromedog like this. The "cube" kits, used for scifi (grey) and martians/zombies (red), with 2 link points per side of each square, are PS glue compatible. Or were, when they were sprue based, now they come in bags (I fear the brutal clipping). But the new detail kits look like PVC, at least the screens have details impossible with 2 part mold injection (slide cores? nah). Worst is that retentive players will complain the basic doors are 25mm wide (and I guess that is with frame, so "unpassable"). Probably. For 250 you can get a decent extruder printer (or card cutter, a plotter with a blade tip) and for 500, a resin printer. More advances ones for 3 times that (more cost, less headaches), like Prusa ones.